The idea of a cartridge pen is nothing new (Eagle was making glass cartridge pens as early as 1890). Nonetheless, the history of the modern cartridge fountain pen really begins in 1936, when JiF Waterman  Waterman's largely autonomous French agency  introduced a line of American-made pens modified to take glass cartridges. The "Made In USA" imprints suggest that these modified pens were, at least initially, specially made in the US for the European market. These US-marked pens were based upon the 92/32 and 3V series. Before long, however, more distinctively French models were introduced, including some fully covered in silver or gold. 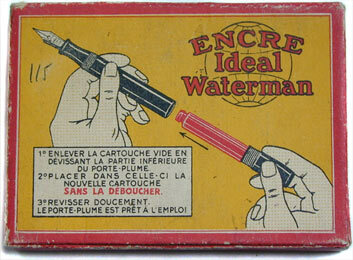 The bottom pen in the image above does not even bear the Waterman name, but only that of JiF, along with the imprint, "Fabrication Française"  yet the 18K nib is still US-made. Production of these pens appears to have been interrupted by the Second World War. 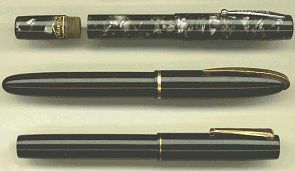 The "Standard" (middle, above) is a postwar example, but by 1953 Waterman had introduced the C/F, the fountain pen that inaugurated the era of plastic ink cartridges and relegated the glass cartridge to obsolescence.